GWH12AB-A3DNA1B/O GWH12AB-A3DNA1B/I GREE Air Conditioners And Heat Pump. Manuals, borchures, specifications, information, reviews. 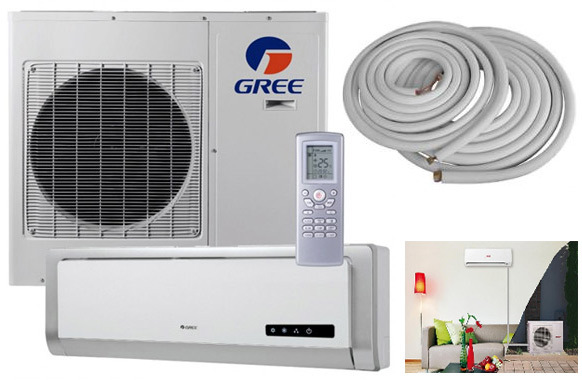 Ductless Air Conditioner - LOWEST PRICE GUARANTEE We beat all package deals! Fast Shipment, Best Warranty, With All Orders! $130 for * Shipping And Handling, includes Insurance. When it comes to air conditioners, you want an energy-efficient system that helps you keep cool without raising the heat on your energy bills. The EVO is a high-efficiency ductless split system designed to run efficiently and powerfully. Compact and attractive, its contemporary good looks works well with all interior designs. Yet for all its power, the EVO comes with a wireless remote that’s intuitive and simple to use. So you not only cool down faster but efficiently as well. The EVO has a built-in intelligent I Feel Function that uses the remote to sense the temperature and adjusts air flow for maximum comfort and energy savings. Smart and beautiful, the EVO never fails to please. 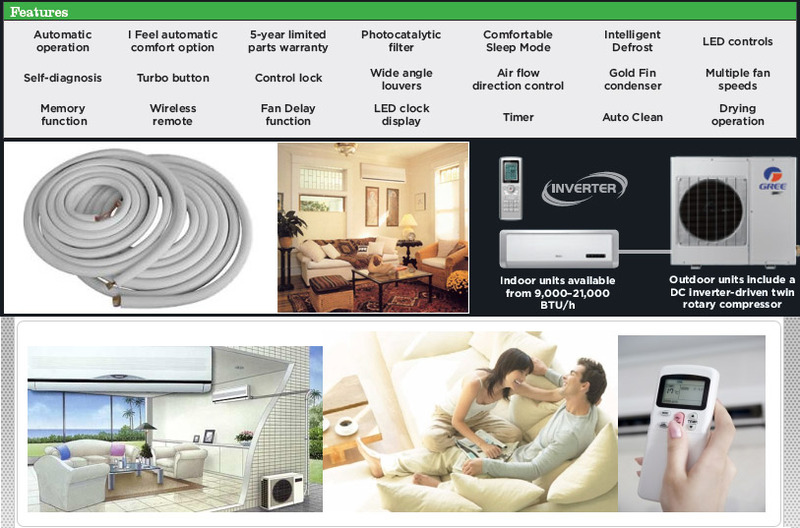 Inverter Technology saves money and energy, reduces noise and keeps temperatures steady by eliminating the harsh starts and stops of conventional systems. Gold Fin Condenser Coil protects against the corrosive effects of outside air, extending the operating life of your system. I Feel Function uses the remote to sense surrounding temperatures, adjusting the air flow accordingly for maximum comfort and energy savings. Comfortable Sleep Mode allows you to design a cycle that follows your sleeping pattern to maximize comfort and reduce utility bills. Intelligent Defrost reduces energy loss and defrost time by only defrosting when needed instead of by a set timer. From one room to several (multiple indoor units), the Evo high-efficiency, ductless mini split system delivers affordable cooling and heating with unmatched comfort that’s founded on 20 years of world-leading innovation and backed by a five-year warranty. Unlike a traditional system, the Evo achieves up to 23 SEER efficiency, improves air quality and provides comfort within the independent environments of shared spaces like condos, retail stores and offices. Cooler or warmer temperatures are generated with an eco-friendly R410A refrigerant that flows from an outdoor compressor to the indoor unit. By not using ducts, we have eliminated the rumbling noise and inefficient heat loss of ducted systems and the expensive installation obstacles. Plus, users get room-by-room temperature management with minimal fluctuation and a variety of sophisticated features designed to enhance comfort. At the core of Evo is a high-efficiency compressor engineered to reduce up to 59% of your energy consumption while sustaining high standards of performance. This technology allows you to live comfortably while also reducing your utility bills and environmental impact. Enjoy perfectly managed comfort and uncompromising personal style with the Evo’s unique combination of quiet operation and installation flexibility. The contemporary design is an aesthetic complement to the clean lines of any modern room, and the soft white panel color accents almost all existing color schemes.